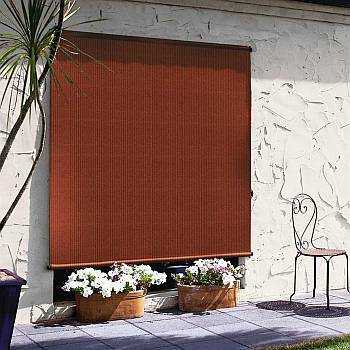 Coolaroo Outback Terracotta Sun Shades are made of knitted of PVC coated all-weather polyethylene fabric that keeps out up to 90% of UV rays, yet allows air through. That combination reduces the indoor temperature, and also allows some light to filter in so you can keep an eye on the outside. Outback shade fabric stops the sun's heat before it strikes your window, thus reducing the heat transfer. As a result, your home or business stays cooler. Reduces room temperatures up to 25 degrees when mounted on the outside of the window, which can save 20-25% in cooling energy costs.